First Born has embraced this project with a passion. We went to the library today and he borrowed books on Japan, Thailand, Vietnam, France, Russia and Germany. Today he read his book on Japan, located Japan in his Atlas and drew the Japanese flag. Things like this give me a crazy urge to homeschool. Lucky he won’t have a bar of it. Tonight, we ate the food. Responses from the Ankle Biters were mixed. First Born loved the sushi, Lil Miss only ate the wasabi out of it. Both loved the avocado in the salad but not the salmon. They did like the mayonnaise dressing. The spinach was barely tasted and both claimed they didn’t like it. The chicken and egg on rice was a hit. 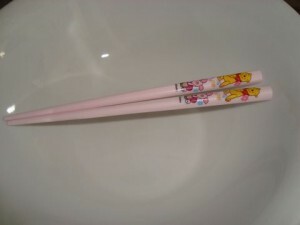 They loved the opportunity to use their chopsticks. The Bread Winner and myself were in agreement. The sushi, salad and spinach were all quite spectacular and well matched. The chicken and egg was good comfort style food but lacked a punch after the previous three dishes. Steam rice, meanwhile, combine vinegar, sugar and salt until sugar and salt are dissolved. Pour over hot rice. Gently fold through. Chill. Insert a skewer through each prawn lengthways to keep it flat when cooked. Boil until pink, drain and cool. Cut belly side open but not all the way through. Remove black vein. Open out flat. Cut fish into strips roughly 7cm x 4cm. Put a couple of cups of water in a bowl and add rice vinegar. This is for wetting your hands to mould rice. Scoop about 1 1/2 tablespoons of su-meshi into your hands at a time and mould into rectangular blocks. Dab a little wasabi along the top of each block of rice and then press prawns or fish over the top. Be gentle. Serve with a little shoyu on the side. Cut short end from salmon then cut lengthways down thick end. This will give you three pieces of similar size. Pour lemon juice and 2/3 dashi into a large dish. Place salmon piece on top and cover with remaining dashi powder. After 15 minutes, turn salmon. Leave for another 15 minutes. Salmon should be pink as though lightly cooked. Cut into 5mm thick strips across the grain. Mix mayonnaise ingredients in a small bowl. Spread a small amount over the back of each lettuce leaf. Halve the avocado and sprinkle with remaining lemon juice mixture. Slice into strips the same thickness as the salmon. Carefully remove from skin with a spoon. 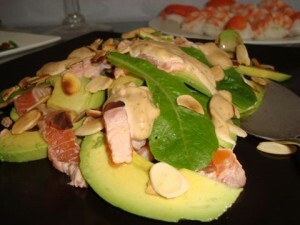 Arrange salmon, lettuce and avocado on plate. Top with almonds and remaining mayonnaise. Grind peanuts in theromomix or mortar and pestle. Transfer to a bowl. Add shoyu, sugar, water and dashi to bowl. Combine thoroughly until you have a very runny looking peanut butter. Blanch spinach in boiling water for 30 seconds. Cool and drain under cold running water. Drain until all water has gone. 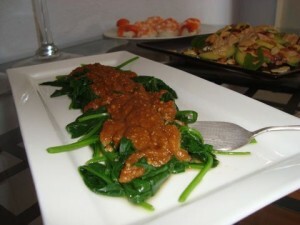 Arrange spinach on plate topped with peanut sauce. This is served at room temperature. Combine water, dashi, mirin, and shoyu in frypan with lid. Bring to boil. 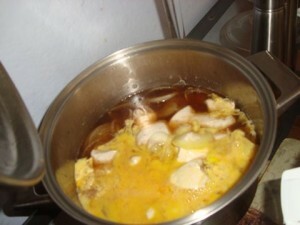 When chicken is cooked through, pour beaten egg on top, replace lid for 30 seconds. Do not stir. Remove from heat and let stand for 1 minute. The egg should still be soft. *thighs were recommended and would have been much better but for some strange reason I couldn’t get any. *I originally planned to put the concept and meals from every night into one post. It has quickly become obvious that would be a ridiculously long post so I will attempt to blog each night of the challenge. Or as close to as I can. Thanks Karen. I’m not quite up to Japanese style presentation but I think it worked out pretty well. Nice work with sushi. 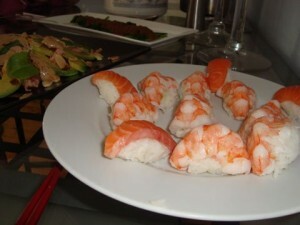 I only wonder how exactly can I make sushi rice with thermomix??? Whats the speed and temperature settings??? Would you please advise on this??? Thankx!